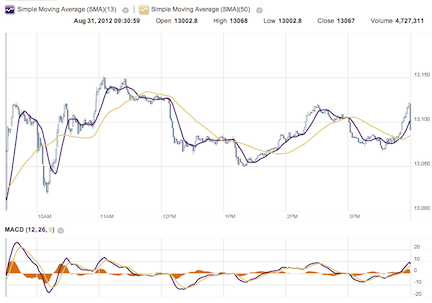 D&D Note (8-31-2012) ~ Algorithms Get It Wrong? Today was the day that every investor, trader, economist, politician, you name it was waiting for. The day when Helicopter Ben gave his speech at Jackson Hole Wyoming. What came out was essentially… more of the same. Immediately the algorithms brought the market straight down. But then we humans… yah people who really care about money brought the market back up. And it seemed the whole day it was humans vs computers and at the end of the day we actual people who spend money on things won the day. The real story behind todays move might just be gold. The shiny metal rallied well today on the idea there will be more money printing lifting the metal which is based in Dollars. The SPDR GOld Shares Trust ETF (GLD) rallied 2.31% to close at $164.22 a share. So what does it all mean now? 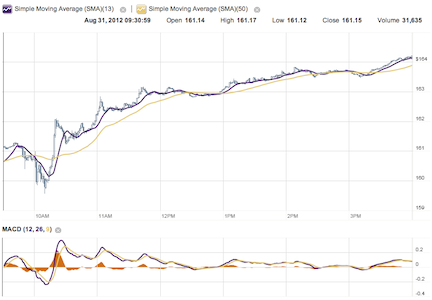 Most likely either another easing moment, or QE3, around Sept 15th or after the Presidential elections. Other “easing” we may see could come from the ECB, Bank of England, People’s Bank, and the BOJ. In other words that one day central bank easing moment is still to come, and don’t be surprised to see just one day give all the gains you’ll need. Thats the day you absolutely don’t want to miss out on (and happened last year). At the end of the day we just concluded summer and have had low volumes. Don’t be surprised to see volume kick in during September, and to the downside. At the end of the year we’ll end up overall but will have a lot of volatility until then. 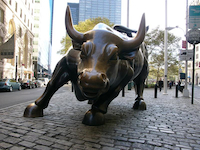 Today the Dow (INDU) finished up 90.13 points at 0.69%. The Nasdaq (COMP) gained 18.25 points at 0.60%. And the S&P 500 (SPX) rose 7.10 points at 0.51%. Oil gained $1.85 to close at $96.47 a barrel. Gold rallied $30.50 to close at $1,687.60 an ounce. The 10-Year Note rose pushing the yield down to 1.56%.